Read our helpful guide to second hand Alfa Romeo GT. AA Cars works closely with thousands of UK used car dealers to bring you one of the largest selections of Alfa Romeo GT cars on the market. You can also browse Alfa Romeo dealers to find a second hand car close to you today. 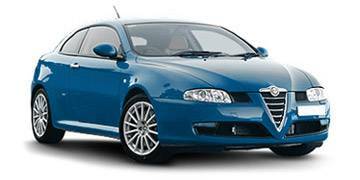 All used Alfa Romeo GT on the AA Cars website come with free 12 months breakdown cover. First released in 2003, the GT is a stylish, swift and elegant coupé, which offers little in the way of practicality, but plenty of Italian pizazz. Based on the 147 saloon, the GT wasn't strictly a new model when it was first released, but there is enough new engineering under the bonnet, and new design cues to make it one of the best Alfa Romeos to be produced since 2000. The 1.9 JTD turbodiesel is arguably the best power option in the range, but the 2,0 JTS petrol option is equally adept at propelling the GT along with good power and refinement. The 3.2, although quicker, feels a little too powerful for the GT chassis, though. With just two seats and a mid-sized boot, there is little family practicality in the GT, but there is plenty of refined, good looking excitement - something Alfa Romeos are certainly better at.